A rare affordable horse property perfectly set up in the beautiful equestrian neighborhood of Hangen Ranch. This 3.62 acre ranch has it all. Ride the local trails to park trails from house. Completely fenced w/2-stall barn, paddocks, tack room, hay storage, & newer loafing shed w/ 2 more paddocks. Water hydrant for easy watering at both barn & loafing shed. Power to barn. Domestic well. Arena too, all within steps of the house. Two fenced pastures. Charming & cozy ranch style home features open living room w/rock fireplace, skylights & wood floors. Watch your horses from the porch, deck or window of your knotty pine kitchen. Large, sunny 2nd bedroom makes a perfect studio/office. Deck w/hot tub. Paved driveway w/room for RV & more. Several outbuildings to accommodate the ranching lifestyle include 12x16 workshop, 12x16 storage building, large chicken house, and carport. Garden area too! 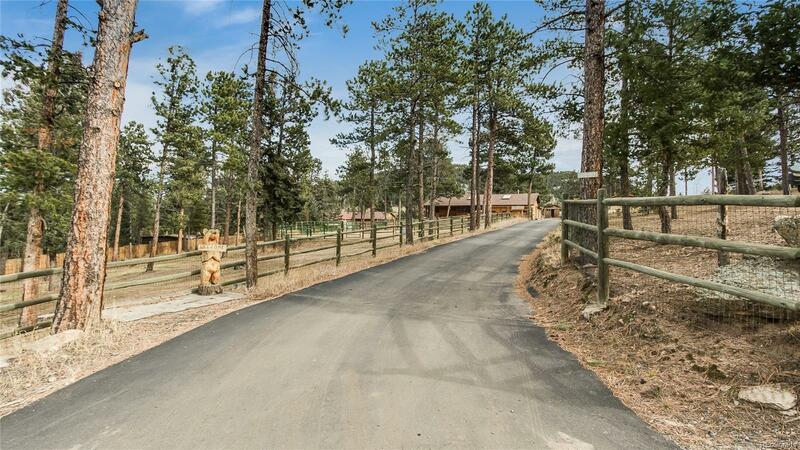 The Colorado life can be yours just 10 min from downtown Evergreen & 25 min to I-70!